Attleboro, 2 vs. Southeastern, 1 – Final – Attleboro’s Cam Littig and Ryan Morry each scored to lift the Bombardiers to a key division win over Southeastern (15-4). 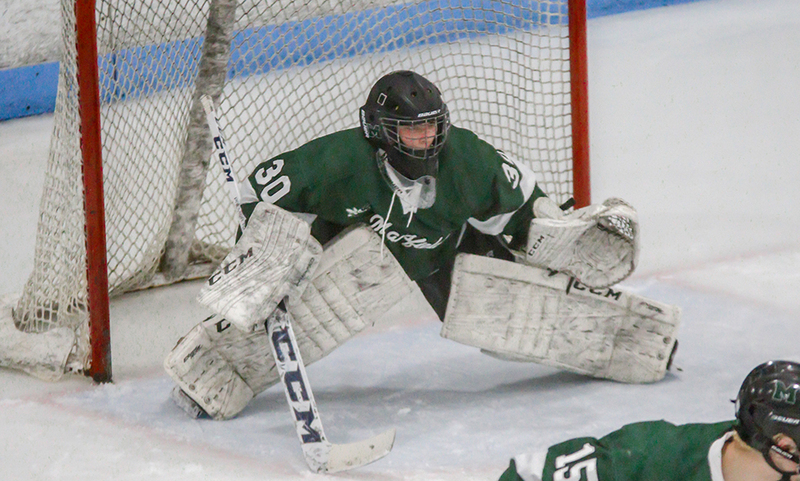 Canton, 0 @ Oliver Ames, 1 – Final – Oliver Ames junior Matt McCormack scored early in the first period and sophomore Owen Connor had a strong game in goal, making 42 saves to earn the shutout in a non-league clash at Warrior Ice Arena. McCormack took a pass from sophomore Jake Gottwald to score the game-winning goal. Mansfield, 4 @ Brockton, 1 – Final – Mansfield junior Chris Copponi scored a hat trick in the first period, the second two less than a minute apart to lift the Hornets to a win on the road. Copponi opened the scoring on an assist from Nick Levine. Coleman Jenkins and Jake Lund set up Copponi’s second goal, and Lund and Tyler Oakley earned helpers on Mansfield’s third goal. Cullin Anastasia added a goal in the second period with Chris Kelleher and Adam Anastos assisting. Taunton, 9 vs. Durfee, 1 – Final – Taunton’s Cam Sneyd scored a hat trick, Mike Albert and Jakob Roberts each found the back of the net twice. Canton, 2 @ Mansfield/Oliver Ames, 1 – Final – Canton’s Kendra Farrelly scored a pair of goals to help the Bulldogs pick up the win. With the win, Canton clinches at least a share of the first ever Hockomock League title for girls hockey. Hockomock League Championships – Click here for a recap and a photo gallery of this game. Hockomock League Championships – Click here for the Results and a Photo Gallery from this meet. Canton, 1 @ Mansfield, 2 – Final – Mansfield scored a pair of goals in the first period and killed a late penalty in the third period to earn the win over the Bulldogs. Junior Adam Anastos tipped in a shot from sophomore Austin Ricker on the power play to open the scoring with six minutes to play in the first. The Hornets then doubled the lead late in the first, with Cullin Anastasia scoring off a feed from James Bezeau. Canton sophomore Ryan Nolte cut the deficit in half in the second period with a power play goal but the Bulldogs couldn’t find an equalizer. “We had two great practices coming into the game,” said Mansfield head coach Mike Balzarini. “We played great in the first period and that penalty kill at the end was huge.” Tony Rullo made 29 saves for the Hornets. Foxboro, 1 @ North Attleboro, 8 – Final – North Attleboro senior Zach McGowan scored a natural hat trick, netting three straight goals in the second period to help the Rocketeers to a big win. Foxboro’s Mike Carresi opened the scoring in the game but goals from North’s Will Yeomans and Erik Clements had Big Red ahead after one period. Jason McNeany, Devin Sparrow and Colin Young also scored for North Attleboro. 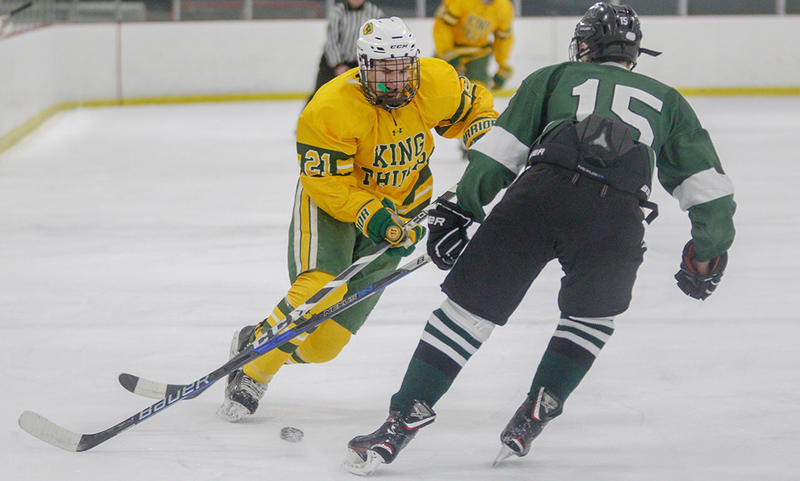 Oliver Ames, 6 @ King Philip, 4 – Final – Click here for a recap of this game. 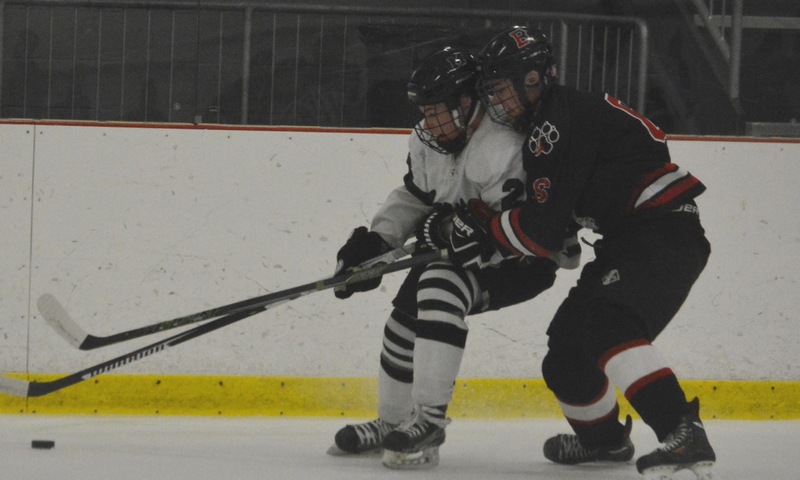 Stoughton, 3 vs. Apponequet/Connolly, 3 – Final – Stoughton scored the first goal to take a 1-0 lead but had to battle back late in the second to tie the game 2-2. Both sides scored once in the third period. 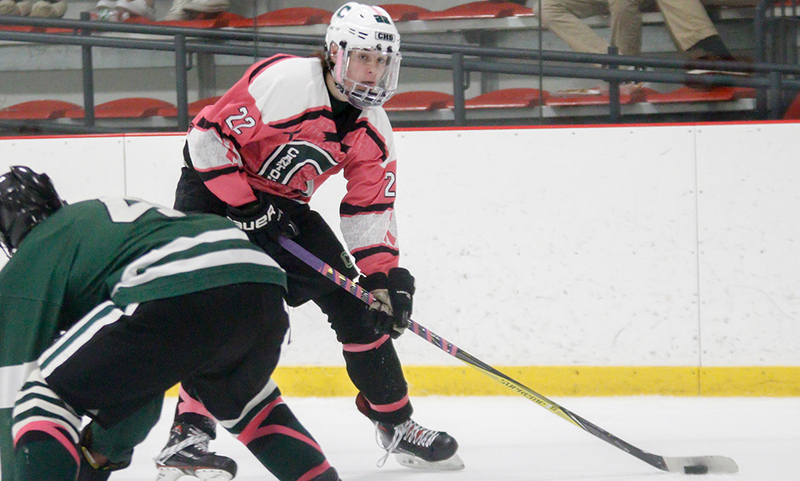 Sean Doherty, Ryan Chipman and Brendan Campbell each had a goal for the Black Knights. Div. 1 State Dual Meet (Franklin) – Franklin took home third at the D1 State Duals meet. After a bye in the first round, Franklin beat Framingham 42-16 but suffered its first in state loss of the season with a 31-24 loss to Lincoln-Sudbury in the semifinals. The Panthers won the third place match 40-22 over St. John’s Prep. Div. 2 State Dual Meet (North Attleboro, Oliver Ames) – Oliver Ames took down Concord-Carlisle 36-15 in the opening round but fell to top-seeded Central Catholic, 46-12, in the quarterfinals. The Tigers beat Beverly, 42-34, in a consolation match. Senior Liston Funai, sophomore Anthony Berksza and sophomore Dean Pacini each went 3-0 on the day. North Attleboro had a bye in the first round but fell to Marshfield on a tiebreaker (match wins). The Rocketeers took down Beverly (52-13) and Algonquin (41-24) in consolation matches. Div. 3 State Dual Meet – Foxboro won the D3 State Dual Meet title on Saturday. The Warriors beat Ashland 44-22, Norton 56-17 and top-seeded Wayland 45-32 to claim the state title. Adam Lanctot (106), Matt Kelley (132), Tom Gallagher (138), Brian Kelley (145), and Matt Mullally (160) all went 3-0 for the day. Walpole Quad (Canton) – Canton went 1-2 on the day, securing a winning record in dual meets for 2016-2017. The Bulldogs picked up a win over Scituate but fell to Hingham and Walpole (45-36). Franklin County Tech Quad (King Philip) – King Philip went 4-0, picking up wins over Gramby Regional (66-18), Smith Voke (69-6), Franklin Tech (50-30) and Shepherd (64-18). Sandwich Quad (Mansfield) – The Hornets went 2-0 on the day, improving their record to 15-9, more than doubling their win total from a season ago. Mansfield beat Quincy (33-27) and Sandwich (37-30) on the day. Hockomock League Championships – Click here for a recap and photos from the league meet. Canton, 3 @ Plymouth, 1 – Final – Canton sophomore Maggie Malloy scored a hat trick, netting all three of her goals in the final period to help the Bulldogs pick up two points on the road. FOXBORO, Mass. – Because of the snow that forced a postponement of Saturday’s game with Taunton, Mansfield had gone a week without taking the ice for a competitive game. It may have played a role in the Hornets getting off to a rough start against visiting Brockton on Wednesday evening at the Foxboro Sports Center. Mansfield managed to shrug off the sluggishness, controlling play for the majority of the game, and pulling out a 2-0 victory thanks to a pair of goals by senior Joey Olsen that moved the Hornets to 4-3-1 on the season and extended their win streak to three games. The Hornets struggled to get the puck moving from defense into the attack. Everything seemed to be moving in slow motion, until the final few minutes of the first when Mansfield strung together several chances to take an 8-4 lead in shots. Freshman Chris Jenkins had the first real scoring opportunity for the hosts on a two-on-one with Cullin Anastasia, catching Brockton in a line change, but his shot was stopped by Adam Stagnone. The third line chipped in and brought some energy, nearly creating the opening goal when Adam Anastos fed Jaden Mezner in front only for Spagnone to again come through with the stop. Jenkins had another chance when he dove forward to knock a bouncing puck on goal in the final minute of the first but the Hornets went into the intermission scoreless. Mansfield started the second period with a two-man advantage and it seemed to get the Hornets clicking with Matt Farragher, Jenkins, and Olsen each having chances. Shortly after the power play ended, the Hornets got the lead. Olsen was in the right place on the edge of the crease to backhand a loose puck under the bar (assisted by Jenkins and Farragher). Four minutes later, a major penalty forced Mansfield to try and clear off four minutes of man advantage for the Boxers. Tony Rullo (19 saves) came through with a few clutch saves but the shots were mostly from the outside thanks in large part to the play of defensemen Tim Arnold and Tyler Oakley, who were both immense in limiting the Boxers to shots from the edges. With three minutes left in the second, again just after the Hornets had a power play, Olsen popped up with his second of the night. The senior, who played last season with his club team, raced onto a puck through the middle, got a step on his defenseman, and roofed a backhand shot over Spagnone’s shoulder. Jenkins picked up his second assist on the play. In the third period, Mansfield sought to protect its two-goal lead and looked for the third that would seal the points. The Hornets outshot Brockton 13-5 in the period and but for the heroics of Spagnone, who robbed Mansfield on several great scoring opportunities, it could have been a much bigger win. Farragher had his shot ricochet off the goalie’s mask and Anastasia saw his backhander from the slot kicked aside. Olsen had a bid for a hat trick denied as well. Meanwhile Rullo looked comfortable in goal for the Hornets and was largely untroubled in the third. Mansfield (4-3-1) will try to keep the win streak alive after another break. The Hornets will have a week off before their next game, against Foxboro next Wednesday.